Jim Davidson, Executive Director of the Advertising Coalition, speaks to the attendees at the American Advertising Federation "Advocacy and Action: Day On The Hill" in Washington DC. The Advertising Coalition is an organization comprised of eight national trade organizations, representing advertising, broadcasting and publishing industries. Imagine if every one of your agency’s clients were suddenly forced to pay taxes on all advertising expenses which, for the past 100 years, have been fully deductible under approved US tax policies. Do you think that might affect the decisions those clients make about advertising? Like budgets? Might those decisions affect your agency’s business? Maybe your livelihood? The answers to all these questions are likely to be yes. There is one proposal under consideration in Washington DC that could have devastating effects on the advertising industry and the general US economy as well. This was the main topic of discussion this week as the American Advertising Federation hosted an important meeting in Washington DC. Advocacy In Action: Advertising Day on the Hill is the annual event that brings many of the AAF’s 200 ad clubs from around the country together to demonstrate to lawmakers the power and passion of the advertising industry’s grassroots network. I was on hand representing AAF Seattle and the Washington ad industry, and also to brief the staff of US Senator Patty Murray on this issue. Former US Congressmen Martin Frost (D-TX) and Kenny Hulshof (R-MO) speak to attendees Wednesday. The former lawmakers gave valuable insight into the history of American tax law and current draft legislation that threatens the advertising industry. This year, the advertising industry faces potentially devastating consequences from proposed tax reform legislation being considered in both the US House of Representatives and US Senate. A key element of both the House and Senate versions would significantly alter the long-standing provision of America’s tax code that allows US businesses to take a standard tax deduction of all current advertising expenses, which have been classified as “an ordinary and necessary business expense” since 1913 (1). So-called “pro-growth” tax reform drafts in the House and Senate include proposals which drastically alter that deduction, essentially constituting a tax on advertising. 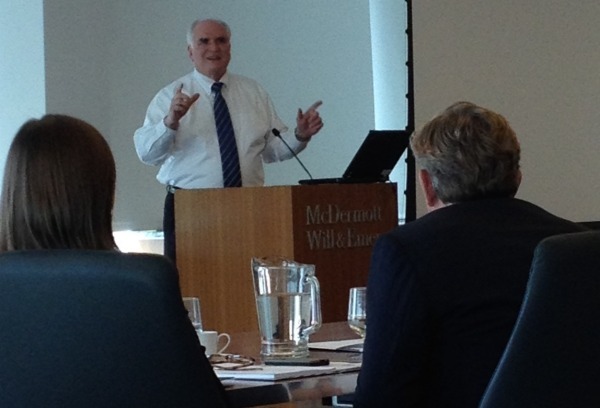 Rep. Mike Kelly (R-PA) as he spoke to AAF members on Wednesday. Rep. Kelly is a member of the House Ways and Means Committee, which is currently drafting tax reform legislation. This measure will also harm the general US economy. Nationally, advertising supports 21.1 million jobs and drives nearly $5.8 trillion in US economic output (3). In Washington alone, advertising helps support nearly a half million jobs (2). Instead of growing the American economy and simplifying the tax code, the passage of this legislation will only slow growth, by causing the loss of millions of jobs nationwide and reducing consumer spending by billions of dollars. The deduction for advertising costs is the correct tax policy. Advertising should remain fully deductible as an ordinary and necessary business expense.